American Point of Sale, LLC proudly servers as the authorized Retalix re-seller for Arizona. Learning to operate ISS45 is a snap. Not only can the keyboard layouts, prompts and screens be tailored to imitate elements of your previous system, but the transaction-specific screens and lead-through prompts enable just about anyone who has ever operated a POS system to feel at home. ISS45 also puts an advanced redundancy scheme to work, protecting your all-important central point store data. An industrial-strength controller system operates smoothly and is always in control so that system capabilities are maintained, even in the case of hardware or PC failures. With ISS45, no management intervention is required to prevent performance delays. Everything is designed to make ISS45 easy, powerful and profitable from the very beginning. In other words, perfect for you. ISS45 uses the grocery industry's favorite communication standards. Inside the store, an industrial-standard Ethernet LAN can move mountains of data between the POS, controller and work-station services- no matter where they are positioned. In fact, ISS45 provides so much performance bandwidth and headroom that a high-performance store of 200 terminals- or more- is easily within its capabilities. And yours. Enhanced Promotions- Item or department-level cents, percents, optional pricing, amounts off per pound, special messages, coupons, points and credits. Group Promotions- Enables the same promotions to be taken across various departments and groups. Level Promotions- Add multiple tiers of qualifications and rewards within any promotion. 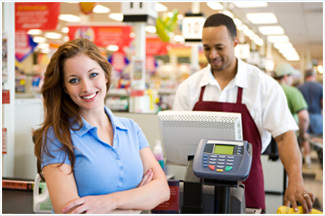 Loyalty- Advanced Promotions can draw on ISS45's Member Card data to qualify a shopper for a given promotion.